to support the rest of the body. Related conditions include evolving HLHS, where the valve is beginning to narrow and there is concern that the baby will have HLHS by the time of birth, and borderline left heart, where multiple left-sided structures are smaller than they should be. Other variations on HLHS include hypoplastic left heart complex and fetal aortic stenosis. Texas Children’s has extensive experience performing in-utero fetal cardiac interventions for all three conditions with some of the most successful outcomes in the nation. In fact, Texas Children’s Heart Center is rated #1 in the nation by U.S. News & World Report. Babies born with hypoplastic left heart syndrome often appear to have blue skin, an indication that their blood lacks enough oxygen. This occurs because the left side of the heart cannot work properly. Pulmonary hypertension, or high blood pressure in the lungs, is a common complication that can cause long-term damage to the lungs. Left untreated, babies with HLHS quickly deteriorate. HLHS occurs in about 1 in 4,344 live births, according to the CDC. Only about 10 percent of those cases are severe enough to require in-utero treatment. Most are treated after birth. It is not known what causes hypoplastic left heart syndrome. An estimated of children with HLHS have an associated genetic condition. Hypoplastic left heart syndrome may be diagnosed by routine ultrasound during pregnancy, usually at 18-20 weeks. Other tests such as fetal echocardiography are usually needed to confirm a diagnosis and to learn more about the defect. HLHS is sometimes not detected until after a baby is born. 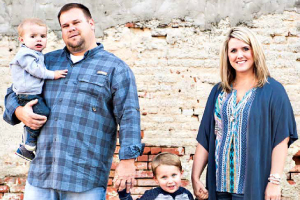 Families who come to Texas Children’s Fetal Center to treat their baby’s HLHS are first assigned a nurse coordinator, who helps schedule the many appointments needed and serves as a resource for questions. This nurse coordinator is available 24/7 to answer any of your questions, help you access doctors and other specialists at any time, and generally guide you through this complex and emotional time. Your coordinator will collect any previous diagnostic tests and arrange a fetal echocardiogram. You will tour the CVICU and meet your team of doctors, which may include an obstetrician, a maternal fetal medicine expert, fetal cardiologist, geneticist, cardiothoracic surgeon and neonatologist. HLHS is a complicated condition that requires numerous specialists work together to create a treatment plan that results in the best outcomes. In addition to the several specialists mentioned above, you will also need an anesthesiologist for the mother and one for the baby, and a fetal echocardiogram specialist. At Texas Children’s, any specialist your child needs can be found at the same hospital where baby is delivered. Texas Children’s Hospital is the first in the southwestern U.S. to create a program to treat these defects in-utero. Our Fetal Center brings together a large, multidisciplinary team of fetal cardiologists, obstetricians and gynecologists, interventional cardiologists, congenital heart surgeons, fetal imaging experts, maternal and fetal anesthesiologists and other clinical specialists to treat HLHS. If a baby is determined to have hypoplastic left heart syndrome (HLHS) with an intact atrial septum, they may be a candidate for a fetal surgery called balloon atrial septostomy. 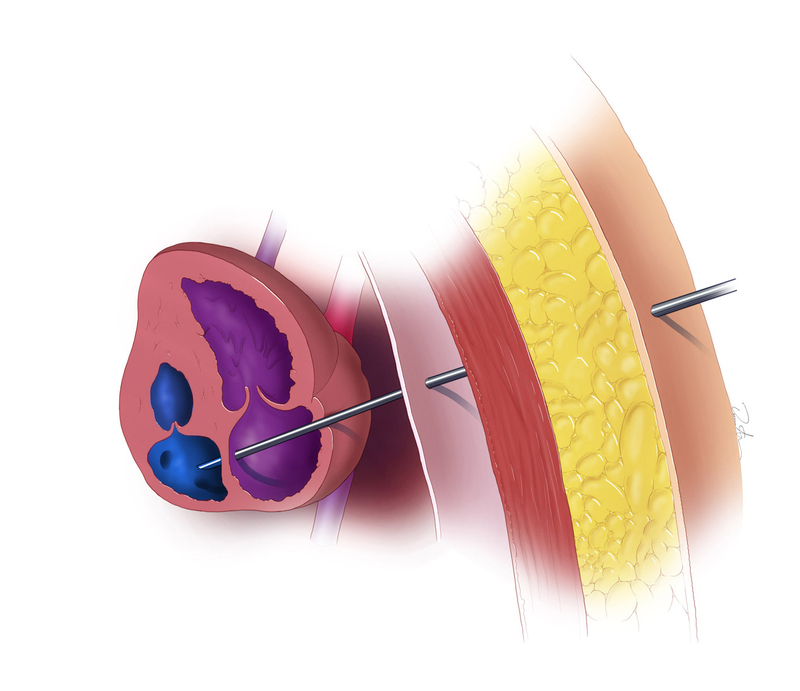 This procedure allows blood to flow correctly between the atria. Another option may be a procedure called balloon dilation of aortic valve. We perform this catheter-based procedure for babies with severe aortic stenosis in-utero (evolving HLHS). 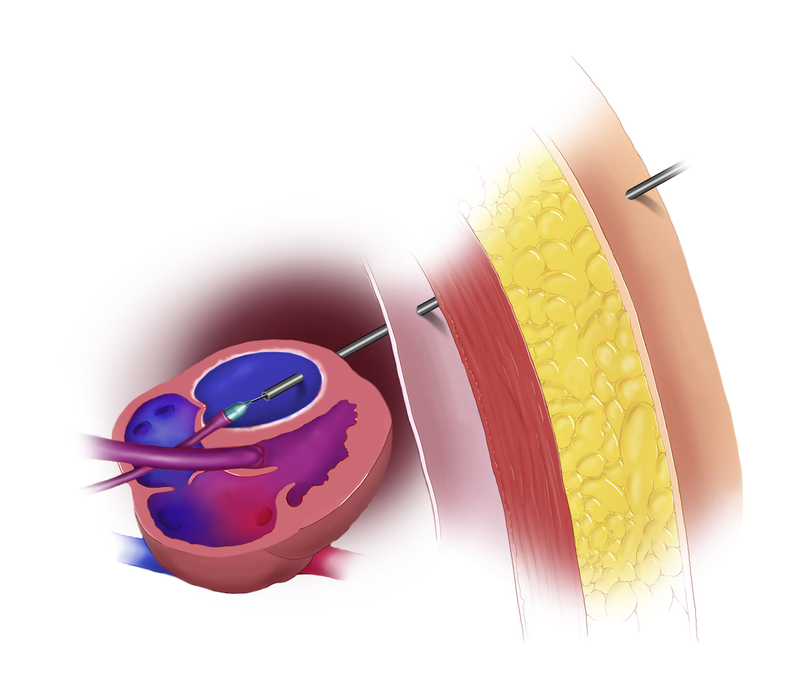 A tiny balloon is inflated inside the aortic valve to open up the leaflets, which is then removed. This allows blood to flow more easily through the left side of the fetal heart and potentially improve growth of left-sided structures. Babies who already have HLHS in-utero with no potential for growth of the left-sided structure depend on a hole in the atrial septum to keep blood circulating throughout their body. In some babies, this hole either does not exist or it is too small, and they have a high risk of complications and death. In a catheter-based procedure, we use a balloon or stent to create an atrial septal defect (a hole between the top chambers of the heart) to keep blood flowing through the fetal heart. For fetuses with borderline left heart, Texas Children’s Fetal Center is the first in the country to offer a new research protocol in which mothers receive daily oxygen therapy throughout their third trimester. By delivering extra oxygen to the mother through face mask or cannula, we hope to increase the amount of oxygen in her blood, the amount of oxygen going to the placenta and fetus, and ultimately the amount of oxygen flowing into the fetal lungs and into the left side of the baby’s heart. 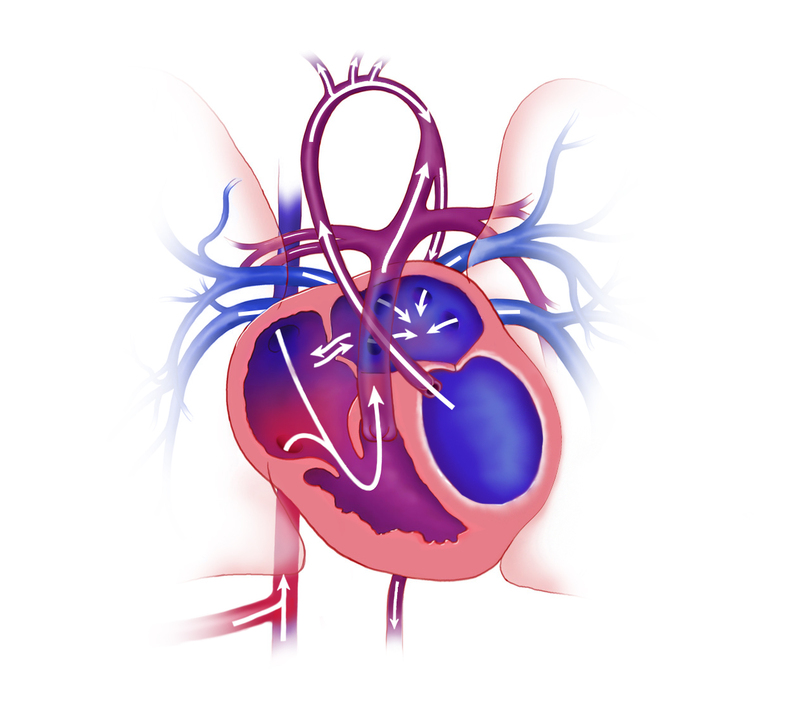 By improving flow to the left side of the heart, growth should improve as well. If hypoplastic left heart syndrome is not diagnosed until after a baby is born, the Texas Children’s Heart Center steps in. Our Heart Center is #1 in the nation according to U.S. News and World Report, making our Fetal Cardiology Program the place to be if your unborn child has a heart issue such as HLHS. Periodic checkups throughout childhood are common, with appointments scheduled with the entire team all in one day to make it easier on the family. Because hypoplastic left heart syndrome is complicated to repair, most babies require three or more surgeries after birth, depending on the severity of the defect and how long it takes the baby to gain strength after birth. These surgeries are risky and require great skill because at this stage, the baby’s heart is about the size of a large grape and the left ventricle is about the size of a pea. Norwood – A Norwood surgery takes place in the first week of life. This is a major, open heart surgery to repair the aortic arch so that it can better provide blood flow to the body. The pediatric heart surgeons at Texas Children’s have been performing Norwood procedures since 1995. Recovery takes place in a CVICU and takes three to four weeks. Glenn – At four to six months, the next operation takes place – the Glenn. This operation diverts half the blood from the heart directly to the lungs for reoxygenation so that it does not have to pass through the ventricle. 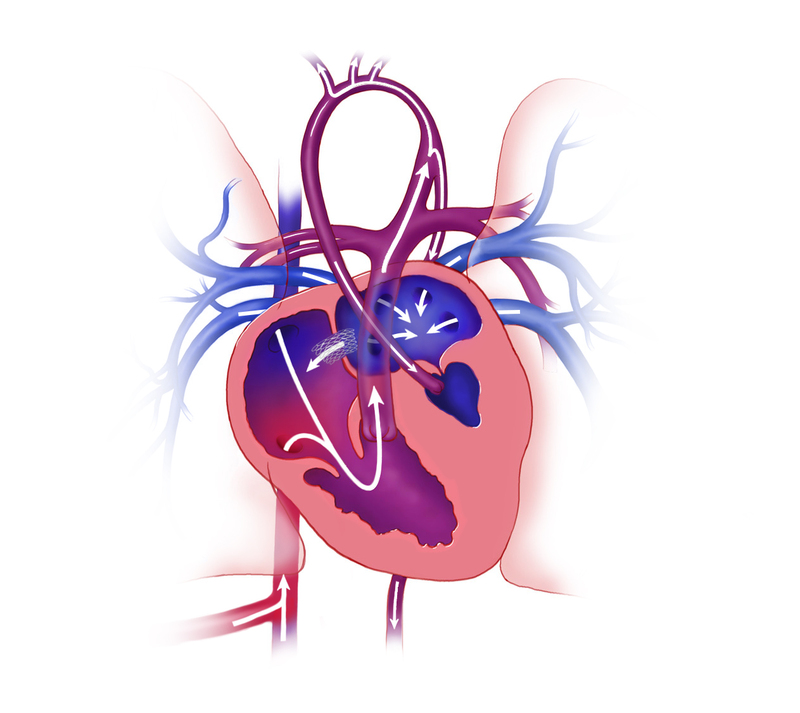 Fontan – The Fontan is usually performed 18 to 36 months after the Glenn operation. This creates a separate channel to direct blood to the pulmonary artery. It is vital that a baby with HLHS be delivered in a hospital with both advanced NICU capabilities and care for the mother. This is because babies with HLHS often require aggressive resuscitation to improve their chances for survival. Perhaps most importantly to your family, your Texas Children’s team will offer you the best plan of care available with as many options as possible, then let your family make a decision without judgment. Texas Children’s, with its partner institution Baylor College of Medicine, constantly strives to seek new and better treatments for babies with heart issues of all types. For more information, please contact the Cardiovascular Clinical Research Core at 832-826-2064 or email sandrea@texaschildrens.org. For fetuses with borderline left heart structures, Texas Children’s Fetal Center was the first in the country to offer a research protocol in which mothers receive daily oxygen therapy throughout their third trimester. By delivering extra oxygen to the mother through a face mask or cannula, we hope to increase the amount of oxygen in her blood; the amount of oxygen going to the placenta and fetus; and ultimately the amount of oxygen flowing into the fetal lungs and into the left side of the baby’s heart. By improving flow to the left side of the heart, growth should improve as well. We are also studying the effects of extra oxygen for the fetal brain.